You save almost $30.00/year over the monthly subscription! You save over $40.00/year over the monthly subscription! You save almost $60.00/year over the monthly subscription! Try vMarketing risk-free! We proudly offer a 30-day money-back guarantee. 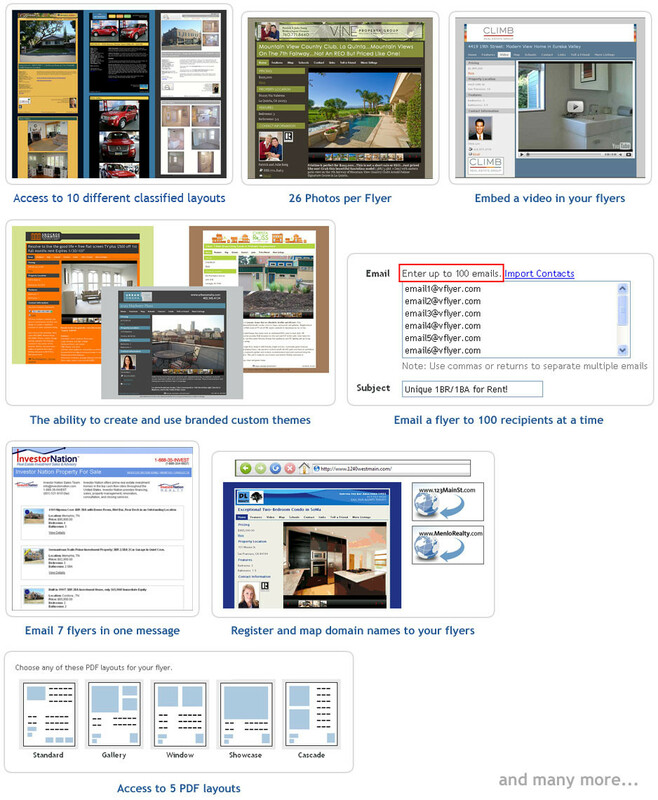 How do vFlyer Marketing subscriptions work? When you sign up for a vFlyer Marketing subscription, you are purchasing a set number of active listings at any one time. For each listing, you&apos;ll get a designated landing page, an HTML flyer to post to Classified Ad Sites, a printable PDF, and an email template, among other benefits. You can sign up for either a monthly or an annual subscription. In either case, your subscription will automatically renew at the start of each billing period. For annual subscriptions, you will receive an email a couple weeks before your subscription is set to renew. We accept payment by credit card (MasterCard, Visa, Discover, and American Express) with billing addresses in the U.S. and Canada. For annual subscriptions, we also offer payment by invoice and PayPal. Please email us at support@vflyer.com or call us at 800-594-5930 for either of those options. Absolutely. To cancel your subscription, just email support@vflyer.com indicating the email address associated to your account and when you want us to cancel the subscription. There are no refunds for partial months and domain name reservations. Can I downgrade to a lower subscription plan? Of course! Simply contact us at support@vflyer.com and let us know which subscription plan you want and we will take care of the rest. Your subscription will be downgraded at the start of the next billing period. If I upgrade to a higher subscription plan, will I be credited for what I already paid? Yes. When you upgrade your account, the amount for the unused portion of your current billing period will automatically be applied to your new subscription. A sub-account is an account that is linked to the main account. It can be accessed by the owner of the main account and any designated assistants to the main account. Sub-accounts are useful for segmenting your listings and can be assigned to different agents, offices, or clients for them to use. There is an additional charge if you want to delegate sub-account(s) to specific individuals. What if I need more than 125 listings or multiple accounts? vFlyer does offer custom subscription plans for members that require more than 125 listings at a time or multiple accounts. Please call vFlyer Sales at (800) 594-5930 x2 for more information.